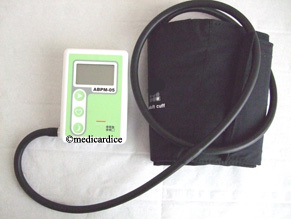 The ambulatory blood pressure monitoring (commonly called MAPA) is a device for automated blood pressure measurement repeatedly during 24 h.
The MAPA consists of an inflatable cuff connected to a manometer by a hose which is connected with a miniaturized system of electronic data storage . The MAPA also helps to classify hypertension and to assess the severity of hypertension (eg absence of lower numbers during sleep is a poor criterion). MAPA also allows to assess the effectiveness of an anti-hypertensive treatment. The cuff is placed on the patient's arm of the patient, the block pump-gauge-digital storage, as a small package, being slung.